Since ponds can be so useful to landowners for a variety of reasons, the impetus to make them where they do not exist is often very strong. As such, those who live on deeply scored lands with ravines at hand may find it exceptionally easy to form these small bodies of water by simply damming one end of the ravine, and allowing the other end to act as a tributary. The process is simple, although it takes more care as the depth of the pond increases. You'll need heavy equipment to do the job right. 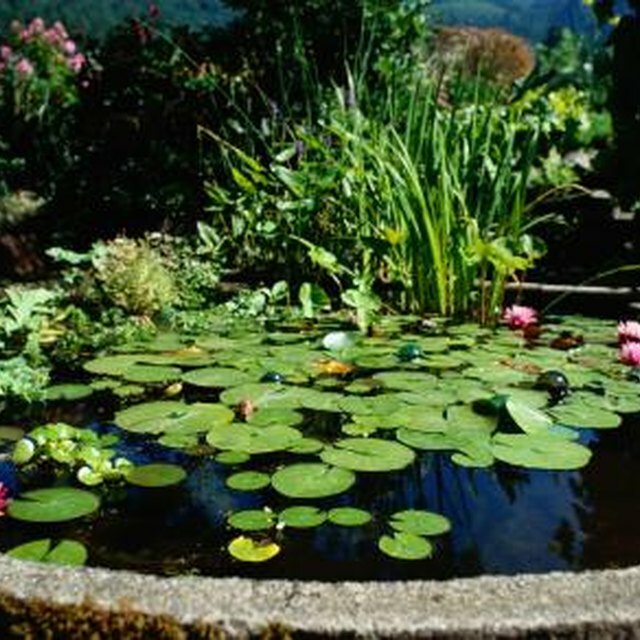 Decide where to locate your pond by examining the property. Not all ravines will make good ponds, so you'll want to look for certain qualities. The ideal ravine will pitch downward---how much depends on how large a pond you want. Since successful fish ponds require a minimum depth of 12 feet, measure the angle of descent from one end of the ravine to the other. If it descends too rapidly, you may get a deep pond that is too small; if it descends too slowly, you may have to find another ravine that will form a more manageable body of water. Use the bulldozer to push as much dirt from the middle of the ravine towards the lower end. Do this only if you need to increase the depth of the ravine itself. Otherwise, you may simply acquire several truckloads of fill dirt (heavy in clay content) and deposit them at the lower opening of the ravine. Use the weight of the heavy machinery to compact the dam, filling in any gaps along the way. Make sure the dam is two times as wide as it is tall for stability purposes. Layer the floor of the ravine with heavy clay soil as well. Use the machine weight again to compact the soil for a highly retentive pond bed. Enhance the tributary system from the surrounding lands so that runoff and drainage is directed toward the ravine. The backhoe can quickly deepen any rivulets or natural drainage paths to increase their capacity and make water delivery more efficient. Plant whatever plants you desire on the backside of the dam to help prevent erosion, which can adversely affect the dam's ability to hold back the forces of water that will build as the pond fills. Monitor the dam daily as the pond begins to fill with natural rain and runoff. If you notice leaks or shifting, sprinkle bentonite (found at local agricultural supply stores) all around the dam on the water side, and reinforce the backside with large boulders or additional truckloads of heavy clay soil.